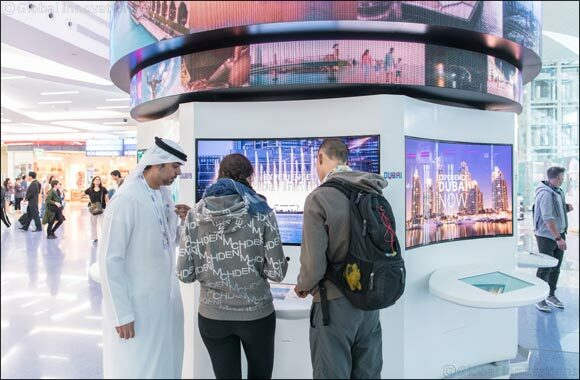 Dubai, UAE; 18 June 2018: Passengers travelling through Dubai International (DXB) can now virtually explore Dubai and experience the wide array of offerings available, thanks to a new, technologically-advanced digital installation set up in Terminal 3, Concourse A, that even creates and sends to passengers via email a tailor-made two-day Dubai itinerary based on the passengers’ interests and preferred experiences. Launched by Dubai’s Department of Tourism and Commerce Marketing (Dubai Tourism), in collaboration with Dubai Airports and Emirates Airline, the activation, titled ‘MyDubai Experience’ in reference to the emirate’s hugely successful local advocacy movement, is designed to provide a futuristic and innovative way for travellers to discover and learn more about the city without setting foot outside the airport. The ultimate goal is to inspire the millions of transit passengers passing through DXB to revisit Dubai in the near future by showing them everything they can experience during a holiday in the city. Located in one of the busiest parts of the terminal and measuring an impressive 6 metres in height and 4 metres in diameter, the new installation comprises state-of-the-art LED tiles positioned to create five 360-degree rings, each exhibiting a variety of photographic, video, social media and user-generated content that has been carefully curated to draw the attention of passers-by and optimally showcase the Dubai proposition. The rings can either work together to produce a single large visual, or operate independently to create a collage depicting a multitude of different Dubai experiences and offerings. Positioned below the five rings are an additional seven 55-inch curved OLED screens and seven 22-inch touchscreens. By interacting with the latter, users are able to affect the content displayed, allowing for a more immersive experience, enveloping users with stimulating, eye-catching content. Available in eight languages, the touchscreens give travellers access to a vast array of Dubai-related information and visuals – attractions, landmarks, activities, experiences, itineraries, maps and much more – all filtered according to their personal preferences and interests. Users can receive further information via email by registering their details, which also automatically enters them into a monthly draw to win a free luxury holiday for two to Dubai, offering them the chance to experience first-hand some of the top attractions highlighted via the installation. Moving forward, the MyDubai Experience will continue to be enhanced, evolving as new and more up-to-date content and capabilities are introduced. Upcoming plans include the launch of two ‘photo-booths’ that will allow users to take a photograph of themselves, overlaid with a choice of illustrated filters, similar to those found in popular mobile phone apps. The resulting email-friendly image will serve as an amusing memento of the user’s stop in Dubai, and can also be shared on social media channels. The MyDubai Experience is now live in DXB International Airport’s Terminal 3, Concourse A.